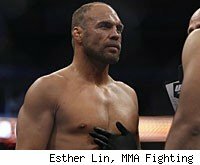 It had only been a few days since Randy Couture retired from mixed martial arts competition after his UFC 129 fight with Lyoto Machida when he returned home to Las Vegas, and one of his first stops was one of his most familiar ones: the cage. Couture walked into his Xtreme Couture gym, changed into his workout clothes and commenced training with a group of pro fighters. "Everyone was scratching their heads looking at me going, 'You know, this is how rumors get started,'" Couture says with a laugh. Just three weeks into his post-fight life, things don't feel much different for the five-time, two-division UFC champion. He still works out, he still takes an active role in working with the fighters in his gym, and he remains a student of mixed martial arts. But, he insists, he is in fact retired for good. Professionally, he's already deep into other pursuits. He's getting ready to film a movie role, and reading scripts for other potential projects. He has a minority stake in a combat sports channel, Fight Now TV, that is preparing to launch later this month. He's got his gyms, clothing line and supplement line. Yes, in retirement, Couture is busier than most people are during their careers. "I don't know what a 'retired fighter' feels like," he said. "I feel great. I'm happy where I'm at in life. I think it was the right time to stop competing. I think I'll always train and I'll always be working with the guys and working in the sport in some capacity, but it was the right time for me to bow out of the octagon. I know there will be some bridges to cross. I think they will try to tempt me to come back in, but I'm comfortable with my decision. It's the right time for me." If Couture's final fight didn't end the way he and the majority of fans wanted -- he was knocked out in the second round by Machida -- at least the setting and reception were grand. Nearly 56,000 people crammed into Toronto's Rogers Centre, welcoming him for the last time with a roar, and sending him out with a standing ovation. It was the biggest Bon Voyage party MMA had ever thrown, and the mood was only barely dampened by the ending. Couture, considered a master strategist, tipped his cap to Machida, who used a rarely seen switch kick to end things 1:05 into the second. "I'm pretty rational, and it's not like I've never lost before," Couture said. "That's the fight game. I got caught with a good one. He set it up nice. It's not one we had seen him do in any of his other fights. He caught me by surprise. He's a great athlete and a great fighter." While his match was not the main event of the show, the legend's final fight will probably be the takeaway memory for most who were there live or watching on TV. Even as it occurred, there was a tangible appreciation of the moment and its historical implications past the sheer size and scope of what was happening. Before his match, Couture himself snuck out and walked halfway to the cage, just wanting to take in the crowd. But when it came to the fight, walking down the aisle for the last time was no different than the 29 times that came before it. "It was different because it was a huge venue and crowd, but it didn't feel any different," he said. "It felt like another fight. I was excited to be there and be part of it for all the right reasons, for the history of it. But the rest of it, it didn't feel different. There was no nostalgia or any of that going on for me. I'm sure that will come at some point down the road." Perhaps partly because of his unyielding schedule and partly because of the freshness of the situation, that wistfulness has yet to kick in. But Couture, who briefly retired in 2006 before coming back the next year, knows that will come. He's experienced the conflicting emotions that boil within and expects the first hurdle will come when he attends his next event. That will probably come later this month, as he expects to be at UFC 130 on May 28. "It's always hard when you go to shows and you're around fights and fighters to not get antsy, to not feel like you want to train," he said. "Those are the real tests and challenges." He's got enough now that he doesn't think there is any chance he'll be drawn back in. He's got plenty of business activities that keep him busy, and he and the UFC are still figuring out his future role in the organization. In his down time, whenever that is, he's looking forward to the opportunity to hunt and fish, two things he's done since he was a kid but has had little time for lately. But when it comes to athletics, there is, he says, "nothing I feel I need to chase." He accomplished nearly everything he ever set out to do. He helped build a sport. It's why looking back, Couture says he's not especially proud of any one moment or achievement. There were plenty of highlights along the way, but it was simply a career well conducted. There were other fighters, but he was in some ways MMA's first true professional. "I've just had an amazing run for 14 years," he said. "It's been a blast. I'm excited to have been part of all of it. I fought a bunch of tough guys. In some ways I'm excited and relieved that chapter's closed, and this new one is opening."